The Heil Quiet Comfort ET 96 Variable-Speed Two-Stage Gas Furnace featuring the Observer communicating system is designed to take your home to a new level of comfort and efficiency. Teamed with our Observer communicating wall control and the appropriate air conditioner and indoor coil, the Quiet Comfort ET 96 functions as part of a complete communicating home comfort system. Various components of the system “talk” to each other electronically, fine tuning comfort levels while maximizing energy savings. Unlike single-stage furnaces—which often heat up fast and shut down fast, creating noticeable swings in temperature—the Quiet Comfort ET 96 delivers consistent heat and overall comfort. The two-stage heat system operates at the lower, primary heating stage most of the time and automatically adjusts to the higher, full capacity stage if temperatures drop. The variable-speed blower motor can also help increase comfort by maximizing moisture removal during cooling (air conditioner) operation. And the high efficiency blower motor can be run continuously to improve indoor air quality compartment, soft-mount components, and the variable-speed blower motor also reduce operating sounds. When matched with select Heil air conditioners and evaporator coils, the ECM variable speed blower motor can also boost cooling efficiency for increased SEER† rating. Heil units are backed by exceptional warranties, including our No Hassle Replacement™ limited warranty, which gives the original purchaser a replacement unit if the heat exchanger should fail due to defect within the first ten years. Upon timely registration, you also get a 10 year parts limited warranty and a lifetime limited warranty on the heat exchanger. 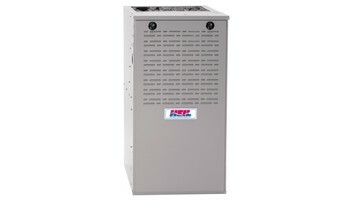 Heil gas furnaces are designed for the best durability and comfort. The warmth and efficiency of natural gas combined with a quiet, efficient blower motor delivers comfort throughout the cold seasons. The gas furnace can also be combined with an indoor evaporator coil and properly matched outdoor air conditioner or heat pump to provide cooling during the warm seasons. When you choose Heil heating and cooling equipment, it means your home comfort is backed by superior engineering and quality manufacturing so you can enjoy more important things. Each unit is 100% run tested, and we design our products to give you the best in quality, energy efficiency and reliability. It’s our tradition to deliver products that exceed your expectations. You can depend on us. The only No Hassle Replacement™ limited warranty that you’ll find in the industry backs every Heil Quiet Comfort product. It means comfort with no questions. We’ll replace your unit if the heat exchanger fails within the covered period. We give you extra coverage in addition to a 10-year parts limited warranty. Get the most out of a heating system by choosing the gas furnace that fits your comfort needs. All of our gas furnaces include comfort enhancing and durable features to deliver lasting performance.